I don’t know how many authors really enjoy reading their own books. In my case, whenever I start a project, I tend to operate under the illusion that it’s a novel I’m going to enjoy reading for my own pleasure. I write stories that I’d like to see, and ones that I don’t think other authors are writing—not necessarily because they’re so original, but because they’ve been tuned to reflect a certain balance of plot, action, and concept that I happen to like. By the time I’m done, though, I’ve spent so long in the story that I can barely see the words on the page, and going back to read it again has about as much appeal as eating the same dinner for three days in a row. Still, there are times when I’ve reread my work and been sucked in despite myself. Short stories like “Kawataro” or “The Boneless One” tend to hold up better, since they were often the product of a few weeks of work, rather than months or years. I can flip through one of my stories and get lost again in the plot, while a novel is usually inseparable from the memory of the year or so it occupied in my life. As a result, it was a little strange to sit down to confront a book that used to be a part of me, only to be set aside and revisited long after the fact. 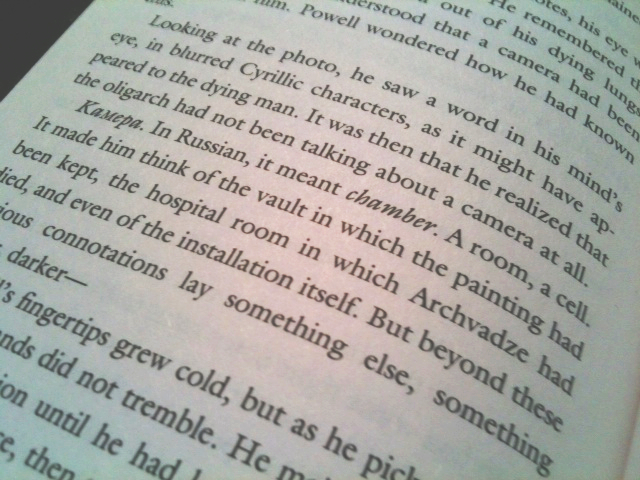 Of course, when I started my author’s commentary for The Icon Thief, I didn’t know what the experience would be like. At first, I saw it primarily as a way for me to get some things off my chest: the book is loaded with references, hints, and little jokes, and I wanted to document those elements so they wouldn’t be lost forever. I also wanted to talk about the decisions I made along the way, showing how logical—or otherwise—my choices had been and how many other directions a story can take. Once a novel is published, it starts to seem inevitable, but really, a text covers up countless alternatives, like the layers of the paintings in The Mystery of Picasso, and I wanted to strip away the surface to uncover some of those discarded variants. Finally, I hoped that the book would provide convenient illustrations and examples for some of the topics I wanted to cover here: plot, structure, handling action and exposition, creating suspense. The result ended up being more of a monster than I expected. A director’s audio track can be tossed off in a couple of hours, but this commentary took close to sixteen months and something like 30,000 words, or a third of the novel itself. 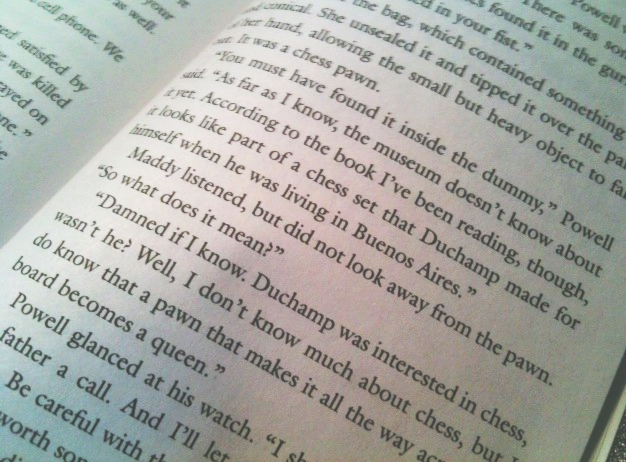 But the most valuable thing about it, at least for me, lay in how it clarified my feelings toward the novel itself. The Icon Thief was my first published book, and like all debut novels, there are things about it that its author would like to change: I’d give more background on the art historical material, for instance, and I’d try to hold the reader’s hand a little more over the first hundred pages. But I’m surprised at how much I still like it. In some ways, it’s an odd, unwieldy novel, and it never fit comfortably into any one category: the cover makes it look like a Da Vinci Code knockoff, but its heart lies with the dry, slightly frigid skepticism of Marcel Duchamp, even as it tries to incorporate big action set pieces and the elements of a crime procedural and international thriller. In the end, though, I think it all sort of works. 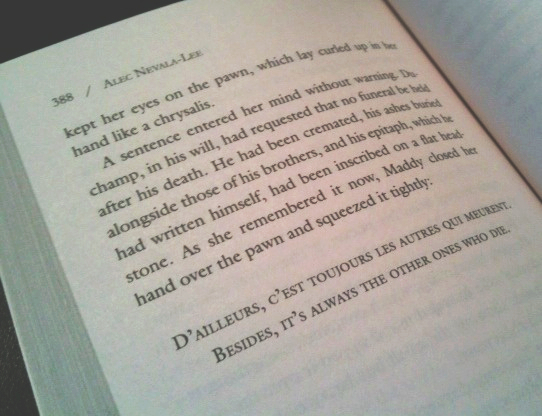 And that’s really the most any author can ask of his own novel. You can tell a lot about a writer by the way he or she approaches endings. Some novelists, like Stephen King, prefer to dive into a story without knowing how it ends, which allows the action to unfold more organically—and also leaves you with the possibility, which we often see in King, of a rousing, suspenseful story that peters out in a vast anticlimax. Others prefer to have a specific ending in sight, or even to work backward from a conclusion, as John Irving says to The Paris Review: “I love plot, and how can you plot a novel if you don’t know the ending first? How do you know how to introduce a character if you don’t know how he ends up?” My own approach, as in most things, involves trying to have it both ways. I generally start with a decent sense of where the story is going, but I postpone any detailed outlining until I’m ready to begin the last fifty pages or so. With The Icon Thief, I figured out the ending pretty quickly, and it remained virtually unchanged throughout more than a year of rewrites. And then, less than a month before we were scheduled to go out to publishers, I changed it. As endings go, I thought it was pretty good, even if the final beat owed a lot to the last scene of Michael Clayton—a movie I’ve raided for inspiration more than once. Later, though, after the rest of the novel had been revised, I found that the ending no longer worked. The greatest single change to the plot, as I’ve mentioned before, was to have Ethan die at Lermontov’s hands. 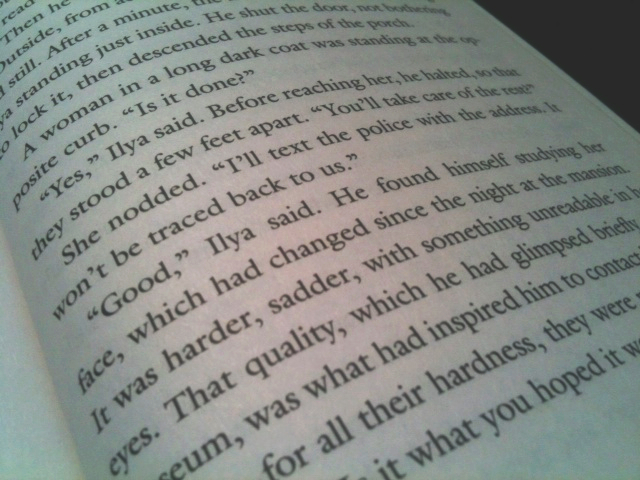 Once that change had been made, the dynamic of the ending, a hundred pages later, was all wrong. Lermontov had to face the consequences for killing such an important character, and the one who most deserved to take revenge was Maddy. I don’t think I realized this right away; it was more an intuitive sense that the balance of the conclusion was flawed. Once I figured this out, the logic of the scene was fairly straightforward, and I wrote it in less than a day. The revised version is told from Lermontov’s point of view, an important fix, and now it’s Maddy who is working with Ilya to tie off the loose ends. Justifying her involvement required a bit of thought, and I’m still proud of my solution, in which Maddy is able to track Lermontov down based on his purchase of an unusual picture frame from the House of Heydenryk, the owner of which later contacted me to thank me for mentioning his company in such a positive light. 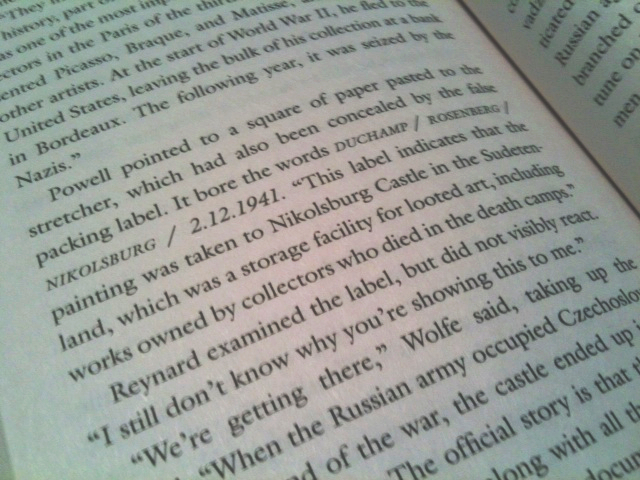 This is the last installment in my author’s commentary for The Icon Thief, which I began over a year ago. Tomorrow, I’ll be looking back over the experience and reflecting a bit about what I’ve learned along the way. 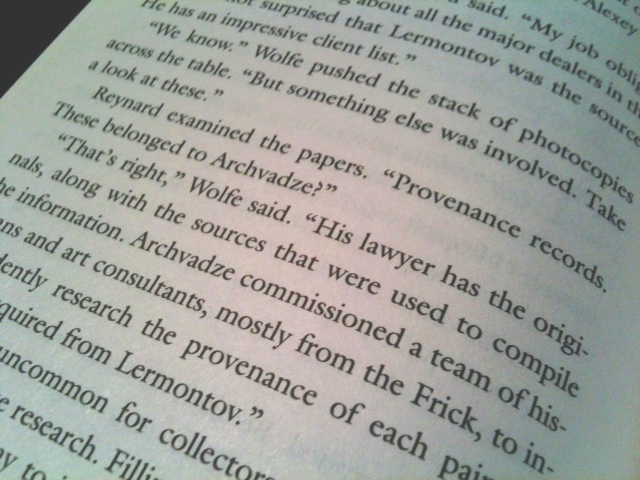 The last chapter of The Icon Thief, not counting the epilogue, has to walk a particularly fine line. Powell’s final speech to Maddy, who is recovering in the hospital after the events at the Philadelphia Museum of Art, essentially tears down the entire novel: the Rosicrucians don’t exist, Maddy and Ethan were suffering from a chemically induced paranoia, and she broke into the installation for no rational reason. I know that this revelation troubled some readers, along with at least one editor, who expressed an interest in acquiring the novel if I could rewrite the ending so that the Rosicrucians were real—which would have meant turning it into another story entirely. Still, in order for this to seem like anything but an enormous cheat, I had to put something inside Étant Donnés for Maddy to find, but it had to play by the rules. It had to be plausible, consistent with what I knew about Duchamp, expressive of the novel’s themes, and evocative enough to compensate the reader for the extended trick the novel had played. And for most of the writing process, I had no idea what this object would be. One piece of advice I’ve learned to share with aspiring writers is that if you aren’t sure how to end a story, take the scene you like best—the one you’re absolutely dying to write—and restructure the plot so that it serves as your climax. This may take a bit of tinkering, since you’ll often be tempted to put the big scene as early as possible, if only because you know you’ll actually get to write it. 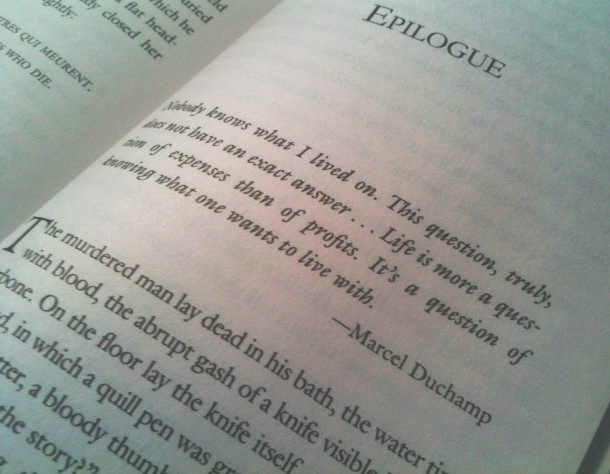 Really, though, endings count for so much that you need to save the best for last. A reader’s opinion of a story will largely turn on how satisfied he or she is by how it concludes, and a novel that unfolds beautifully for three hundred pages won’t survive a failure of nerve in the last thirty. In the case of my own novels, I usually know what the ending will be, at least in general terms, soon after I get the initial idea. The process of writing a novel is so uncertain and unpredictable that it helps to have a destination in mind: when I’m stranded in second-act problems and trying to get out of a jam, it helps to know that I have an ending that will work if I can manage to bring it off. Of course, it’s one thing to know in broad strokes what the climax will be, and quite another to put it into narrative form. For The Icon Thief, as I’ve noted before, I knew that the novel would end with Maddy breaking into the installation of Étant Donnés at the Philadelphia Museum of Art, but I didn’t know what she would find there; I only knew that there had to be something, or else the entire story would seem like one long cheat. I also didn’t know how that moment would tie in with the machinery of the larger plot. Twenty pages from the end, I still had a lot of material to tie off, and for the sake of narrative momentum, I knew that I’d have to stage what followed—Sharkovsky’s attempt on Maddy’s life, Ilya coming to the rescue, and Ilya’s final escape—as close to the installation itself as possible. Trying to cover all of this in a way that seemed surprising and logical within the considerable constraints that the location presented was a real headache, and it took me a long time to make it work. When I first began working on The Icon Thief, I knew that I’d be walking a fine line. For reasons that I’ve discussed before, I’ve always been drawn to conspiracy fiction, but it’s generally been of the skeptical variety, like Foucault’s Pendulum or The Illuminatus Trilogy, which raises as many questions as it answers. 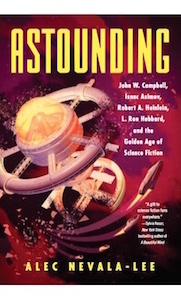 In many cases, the conspiracy at the heart of the novel is revealed to be the product of the protagonist’s imagination or paranoia, and even seemingly unambiguous events can be read in any number of ways. This kind of thing can sometimes feel like a tease for the reader—or an attempt to have your cake and eat it, too—but I think it’s intuitively closer to how I suspect the world really works: the answers we seek aren’t always straightforward, our preconceptions shape what we choose to see, and the search for a overarching explanation can ultimately turn into a perverse form of idealism. So while I didn’t think I’d be capable of writing a straight conspiracy thriller in the Dan Brown manner, I wanted to retain as many of the pleasures of the genre as possible while breaking it down as gently as I could. I’m proud of the novels and stories I’ve published, but if they all have one limitation, it’s that they aren’t comfortable with the idea of a story—or even a scene—in which nothing much happens. This isn’t to say that they’re packed exclusively with action: even Eternal Empire, which probably has more straightforward action scenes than the previous two novels combined, takes a little while to ramp up. But in most respects, there’s always something happening in these books. There are plot points to cover, information to convey to the reader, characters who need to get from point A to point B. The plots are invariably complicated, and most of them were cut down considerably from their original length, which means that each page carries more than its share of story. This is entirely intentional: I like dense, layered novels, and I enjoy seeing how far I can push complexity within the bounds of the genre I’ve chosen. But it’s still an approach that limits the kinds of stories I can tell or moods I can evoke. And although I’m well aware of this, I’m still some distance away from being comfortable with scaling it down. [S]o many American films are pledged to the energy that “breaks out.” Our stories promote the hope of escape, of beginning again, of beneficial disruptions. One can see that energy—hopeful, and often damaging, but always romantic—in films as diverse as The Searchers, Citizen Kane, Mr. Smith Goes to Washington, Run of the Arrow, Rebel Without a Cause, Vertigo, Bonnie and Clyde, Greed, and The Fountainhead. No matter how such stories end, explosive energy is endorsed…Our films are spirals of wish fulfillment, pleas for envy, the hustle to get on with the pursuit of happiness. Needless to say, that’s an impressive list of movies, and many of our best recent films—from the work of Christopher Nolan to Pixar—have been predicated on similar principles. Yet it’s often the stories that find time for silence and emptiness that linger the most in the reader’s imagination, and you’d have trouble finding a truly empty moment in any of my novels. Well, maybe there’s one. In Chapter 55 of The Icon Thief, after Maddy arrives in Philadelphia, she walks across the bridge and heads for the museum on foot. 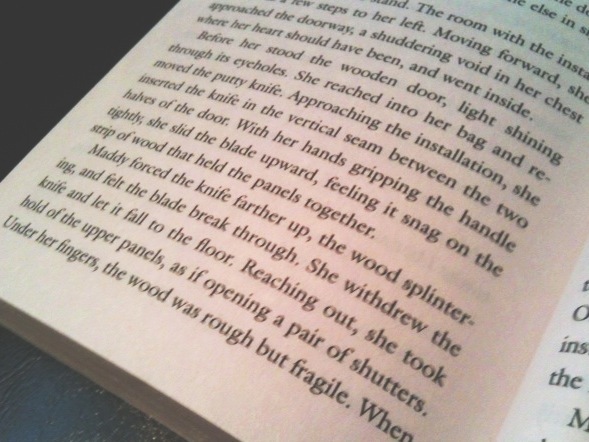 It’s probably the least eventful chapter in the entire novel: there’s a tiny bit of plot, as she stops into a hardware store to pick up the items she’ll need to break into Étant Donnés, but for the most part, we’re alone with Maddy and her thoughts. And I like the result a lot. It’s based closely on my own visit to the city, in which I followed a route much like the one Maddy walks here, taking notes as I went. (Although the hardware store is a fictional one, introduced after I arrived at the museum and realized how difficult breaking into the installation would actually be.) 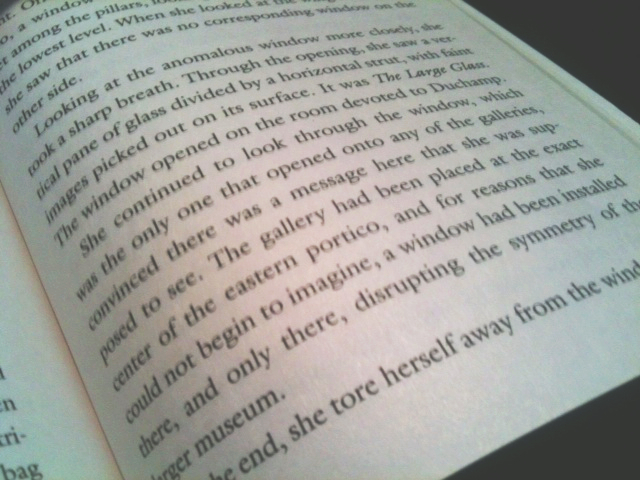 It’s one of my favorite memories from writing this novel, especially for the moment when I paused outside the museum, taking in its layout, and noticed the same curious detail that Maddy does. The museum is laid out symmetrically, with identical east and west wings, with only one anomalous element: a single glass pane, with no corresponding window on the other side, that looks into the gallery devoted to Marcel Duchamp. Three levels of plot: supposed order, alleged order, and real order. This is followed by a long list of potential plot points or ideas from the real world, some of which ended up being crucial to the story that resulted, while others were eventually discarded. Neither Marcel Duchamp nor Étant Donnés are mentioned until the fourth page of notes, at which point I’d been working on the idea for several weeks. 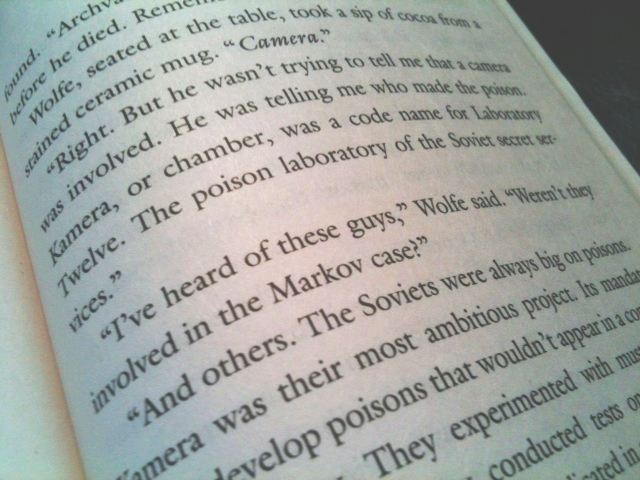 And on the top of the first page is the title of the novel I had in mind: Camera. Regular readers of this blog will know that I’ve rarely had much luck with the initial titles of my novels, and they’ve invariably had to be changed, usually with only a few weeks left before delivery of the manuscript. I have a weakness for opaque, suggestive titles that have more than one meaning, while publishers tend to be happier with titles that clearly signal what the book is going to be about. 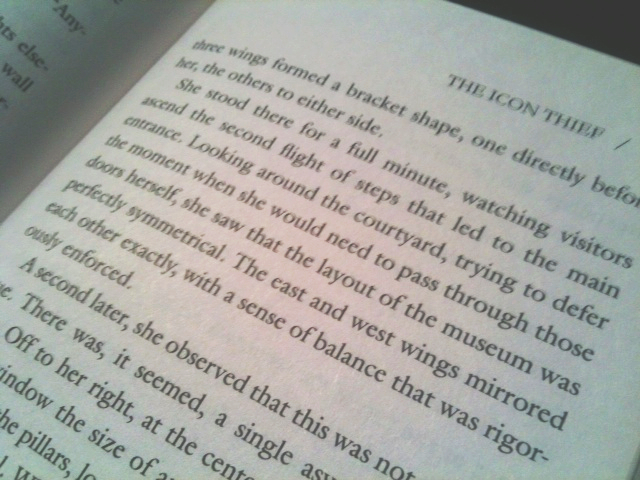 Consequently, I need to walk a fine line, and I’m very happy with the title The Icon Thief. Still, I do miss Camera. I’d wanted to write a novel with that name for a long time, although the original conception survives only as a shadow in what was eventually published: the initial plot, which I now think was probably too ambitious for my talents at the time, was about a man piecing together the reasons behind a loved one’s suicide by looking at the photos on her camera after her death. There’s a touch of this in the finished novel, as Maddy tries to figure out the clues that Ethan left behind, and my research into the life of the photographer Diane Arbus informed some elements of Maddy’s personality. Really, though, its presence in the story is more like that of a ghost, or a double exposure, dimly visible behind the plot’s convolutions. The other inspiration for the title was “Camera” by R.E.M., possibly their saddest and most mysterious song, and one with a particularly haunting backstory. When I wrote that title at the top of the page, I didn’t have a plot in mind yet, but I certainly had a tone I wanted to capture, as well as a handful of themes that had always fascinated me: the gap between what we see and what we think we understand, the tendency for images to be misinterpreted, and the ambiguity of the photographic medium itself. These themes were radically transformed in the final product, and perhaps that’s the way it should be. But the working title achieved its purpose. It allowed me to focus my thinking, emphasizing some themes in preference to others, and at one crucial point, it also informed me that I was on the right track. Early in the process, I realized that the Russian chemical warfare program would be a part of the story, since it allowed me to unite several key themes—conspiracy, paranoia, Russia itself—into one convenient thread. And I still remember the strange thrill I felt when I learned that Laboratory 12, the notorious poison laboratory of the secret services, had also been known as Kamera.